Dhanasri Mahala 5, Ghar 6, Astpadee. Satguru Maharaj Arjun Dev Ji speaks in Dhanasree Raag, the sixth house of beat, rhythm and rhyme, sur and taal. Astpadee - in eight parts. 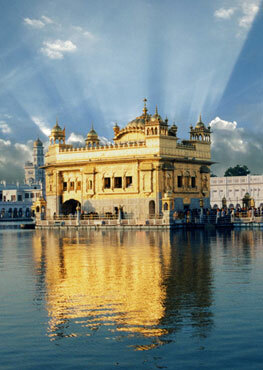 Padee meaning beat, eight feet, eight parts to the shabad. There is one Eternal Waheguru who is the Creator, Nourisher and Destroyer, who is found through the Prasad, of the Guru; the Grace, the mercy of the Eternal Satguru Sri Guru Granth Sahib Ji. Jo Jo Joonee aaio teh teh urjhaaio maanas janam sanjog paiaa. All of those who have 'aaio' - come - into 'joonee', to this world, who are born into as life forms in this world, 'teh teh urjhaaio' - those who are born as 'joonee', those who come into this earth, because of their past actions, their past karam and are born in the circle of reincarnation and rebirth, 'teh teh urjhaaio' - all of them are entangled in this world, with ego, lust, desires, greed or anger. But Guru Ji says 'maanas janam' , this human life, is found, is 'paiaa', through 'sanjog', through blessings, through blessed destiny, means the highest destiny. It's a blessing to have this human life. Taakee hai ot Saadh raakhu day kar haath, kar Kirpa maylhu Har Raiaa. And in this human life, what have I done? 'Taakee', look for, the 'ot', the support of the 'saadhs', of the saints. 'Raakhu day kar haath' - O Saints, please save me! Please give me your hand and take me out of the darkness that I'm in. 'Kar kirpa maylhu Har Raiaa' - O King, O Hari, O God, please meet, unite me with the 'Har Raiaa', that Lord God. 'Kar kirpa', bless me with that Grace, O Saints! Take me by the hand, I've taken your support. Unite me with God. Anik janam bhram thit naahee paaee. Many 'janam' for many life forms, I have been 'bhram', I have been wandering, I have not found stability 'thit naahee paaae', not found a place of rest. Karao sayvaa Gur laagao charan Govind Jee kaa maarag dehu jee bataaee. Rahaao. 'Karao sayvaa' and what does the Saint say? The Saint says do sayva, perform selfless service of the Guru. 'Laagao charan' - and attach yourself to the Guru's charan, to the feet of the Guru. What is the feet of the Guru? 'Chit charan Naam', the Name of the Guru is the 'charan', the feet of the Guru. Attach yourself to God's Name and attach yourself to the feet of the Guru. And when you attach yourself to the feet of the Guru, beg the Guru, say 'Govind Jee kaa maarag', please 'bataaee', tell me, the 'maarag', the path to God. Pause. Think about this today. Anik upaav karao maiaa kao bachit dharao mayree mayree karat sad hee vihaavai. But Guru Sahib Jee told us about the way we live our lives: 'anik upaav karao', I do many different ways, many different methods. I do many different methods, many different ways of getting together money, materialistic goods and other things of this world. And, I do many 'bachit', love for these material things. 'Mayree mayree karat sad hee vihaavai'; my whole life is 'vihaavai', spent, saying 'mayree mayree' - this belongs to me, this and that is mine. That's how my whole life goes by. Koee aiso ray bhaytai sant mayree laahai sagal chint thakur sio mayraa rang laavai. May I meet - 'bhaytai' - such a Saint, 'mayree laahai sagal chint', who takes away 'sagal' all of my 'chint', anxieties and worries. And who can 'laavai', who can attach me to the 'rang', to the love of God? Parray ray sagal bayd neh chookai man bhayd ik khin na dheereh mayraa ghar kay panchaa. 'Parray', I read 'sagal bayd', and all of the bayd, all of the spiritual scriptures, 'neh chookai man bhayd' - 'chookai' means to be removed and 'man bhayd' means to doubt. The doubts of my mind have not been removed. 'Ik khin na dheereh mayraa ghar kay panchaa' - inside my spiritual body there are the five; desire, anger, greed, attachment and ego. They do not let me have any calmness in my mind, even for a 'khin', even for a second. Koiee aiso ray Bhagat jo maiaa tay rahat ik Amrit Naam mayraa ridai sinchaa. Is there any bhagat, devotee of God who is unattached to his 'rehat', who is untouched by this love of material gain and maya, by this illusion of the world? And who can 'sinchaa', who can imbue and colour and shower me with the Name of God, the Amrit, the Immortal Nectar of God's Name? Jaytay ray teerath naa-ay ahambudh mail laa-ay ghar ko Thakur ik til na maanai. All of the holy places of pilgrimage that I've bathed, instead of taking away any dirt, 'ahambudh mail laa-ay', I've attached more 'mail', more dirt of ego. Waheguru jee is not pleased, if we go to his place of pilgrimage, and instead of listening to the Bani, attaching to the Guru and humbly serving the sangat we come back and carry around ego within ourselves that we've been here, we've been there. Lord God who lives within us is not pleased by even a small amount by this. Kad paavao Saadhsang Har Har sada Aanand giaan anjan mayraa man isnaanai. When will I find the 'Saadhsang', the company of the Holy Saints? Joining with them I'll chant the Name of God and forever I'll be blessed with bliss. And in the company of the Saints I can bathe my mind in the 'anjan', in the ointment of 'giaan' - spiritual wisdom, which will take away all of the filth of many past life forms. Sagal asram keenay manuaa neh pateenay bibaykheen dayhee dhoay. I followed out all the 'asram', the four stages of life used to be said in Indian culture that first you are a student then you become a householder, then you start living slightly away from your children and go live in the jungles. Guru ji says that human beings have followed these ways of living but the mind is not coloured or changed in any way. Without wisdom I keep washing my physical self but my spiritual self isn't washed. Koee paaeeai ray Purakh Bidhaataa Paarbrahm kai Rang raataa mayray man kee durmat mal khoay. Can I find any 'purakh bidhaataa', any servant who is coloured in the 'rang', the God's love, of the Eternal Being Waheguru who is the Creator of all our destinies? Who could take away the 'mal' , the filth of 'durmat', of evil-mindedness. Durmat are those clever tricks which take us away from God. That which takes us away from Waheguru ans Guru ji is saying, "Can I find such a Saint who can wash away all of this filth inside me?" Karam dharam jugtaa nimakh na hayt kartaa garab garab parrai kahee na laykhai. I do many 'jugtaa', many methods karam 'dharam' - of rituals, external, but even for a second I do not have 'hayt', I do not have love inside me. I read in 'garab', in ego and Guru Sahib ji says none of this is any 'laykhai' in any account. Jis bhayteeai safal moorat karai sada keerat Gur parsaad ko-oo naytrhu paykhai. That person who meets that character, personality, Waheguru, whose meeting is 'safal' is always rewarding. Meeting with the Guru you forever sing the praises of God. By the Grace of the Guru, only a few people meet with that character, only a few meet with Guru Nanak Dev ji, if Guru Ji blesses you with his own Grace. Manhatth jo kamaavai til na laykhai paavai bagul jio dhiaan laavai maaiaa ray dhaaree. Koee aiso ray sukheh daaee Prabh kee kathaa sunaaee tis bhaytay gat ho-ay hamaaree. Is there such a giver of peace, of 'sukheh daaee', who gets me to listen to, who recited to me the katha, the sermon of God, the praises of God, the path to God? Meeting that person, my 'gat', I'm liberated. Suprasann Gopaal raa-ay kaatai ray bandhan maa-ay Gur kai Shabad mayraa man raataa. When Goopaal Rai, the Creator of this Universe, the King of his Universe, is happy upon me, is pleased with me, He then cuts away the 'bandhan', the entanglements and enslavery of maya, this illusion of the world and material gain. With the Guru's shabad, mantra, 'mayraa man raataa', my mind is imbued in love with the Guru's Words, the Guru's shabad. Sada sada Aanand bhaytio Nirbhai Gobind sukh Nanak laadhay Har charan paraataa. And when you're in love with the Guru's shabad, 'sada aanand', you are forever in bliss. This is the path of meeting Lord God, the Creator of this Universe. Satguru Sahib ji says, "I've 'laadhay'", I've found true 'sukh' in my life when I was attached to the Charan, the Lotus Feet of the God and I attached myself to the Guru's Words. Safal safal bhaee safal jaatraa. My 'jaatraa', my journey has become 'safal', has become blessed and fruitful and satisfactory. My coming and going on this earth has been blessed. My coming and going, 'aavan jaan', my birth and my death has been removed when I have 'milay saadhaa', met with the Saints. My rebirth was all removed; I didn't have to come back onto this earth again for my 'coming and going' was ended and I gained eternal stability. Rahao Doojaa. Guru ji says pause again, on this, and think about it today.